This photo was taken from the main road about five minutes from our house, at sunset one night when storm clouds were rolling in. I love it. It was a spectacular sight. Photos cannot capture the feeling you get from observing an immense ‘big uninterrupted sky’ ablaze with color. I was driving home anxious to get inside before the ‘storm’ broke, and the rain and wind hit hard, thundering down. 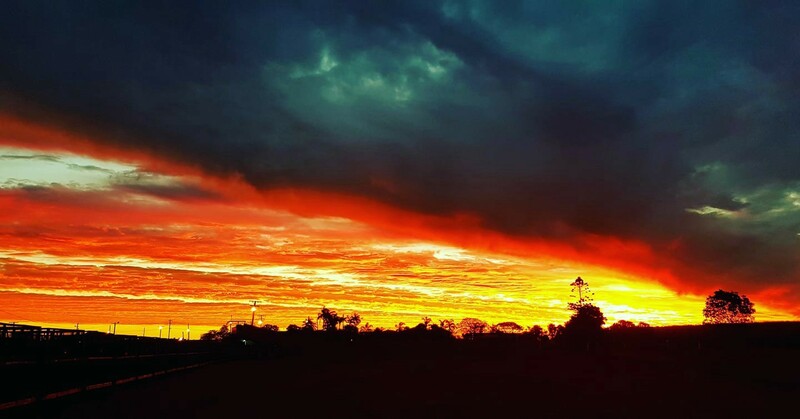 I was observing how dark and ominous the clouds looked and it wasn’t until I looked at the photo that I realized how bright and intense the sky was with the fiery sunset. I had missed the color. What we focus on becomes what we see. We can miss something beautiful and positive right in front of us because we focus only on the negative. The setting sun each night is a reflection of the beauty and magnificence of life. The fading of light and the ushering in of darkness is a reflection of the importance of rest, of our need for inactivity as well as of activity. It is a time for our bodies and minds to rejuvenate, and recuperate. We can choose to see darkness as a necessary contrast, as without the dark storm laded clouds we would not have the backdrop canvas for an impressive and spectacular sunset. Our bodies are naturally attuned to darkness as our circadian rhythm is in tune with the earth and will prompt us to fall asleep (as long as we are not subject to artificial light). Darkness is a reminder of our affinity and connection with the earth and of our relationship with the rhythm of our planet (as are other animals both nocturnal and diurnal).